By Trevor McIntyre: WBC/WBO cruiserweight champion Oleksandr Usyk (14-0, 11 KOs) is willing to face IBF/WBA champion Murat Gassiev (26-0, 19 KOs) in their unification contest in Russia for the July 21 World Boxing Super Series [WBSS] finals in Moscow, according to MatchTV. Usyk, 31, is reportedly negotiating to face the 24-year-old Gassiev on July 21st in Moscow, Russia. Usyk would prefer that the WBSS finals fight take place in England at a neutral site, but it might not be possible. For the Gassiev-Usyk unification fight to make money, it will likely need to take place in Ukraine or Russia where both guys are well known and highly popular. Staging the Usyk vs. Gassiev fight in a neutral venue like England might result in a small audience depending on whether a big promoter like Eddie Hearn of Matchroom Sport is able to promote the fight. There’s speculation that Hearn might make an announcement soon to let the boxing fans know that he plans on staging the Usyk vs. Gassiev fight on his DAZN streaming network. If that happens, then perhaps the fight can take place in England like Usyk says. The fact that Usyk is even mentioning the possibility of his fight against Gassiev potentially taking place in the UK could be a signal that Hearn might be placing it on his DAZN platform. That would be a great deal for the boxing fans that are familiar with both fighters. It would be a great fight in letting people see the two best fighters in the cruiserweight division fight is out for supremacy of the division. The winner of the fight will be viewed as the best fighter in the weight class. There’s not much chance that the Usyk-Gassiev fight is going to end in decision no matter where the fight takes place, It could be staged in Russia, and it’s unlikely the fight will end in controversy because of the huge punching ower of the 24-year-old Gassiev. Usyk had a lot of problems beating Mairis Briedis in his semifinals fight in in Riga, Latvia last January. Usyk was fortunate to win that fight. 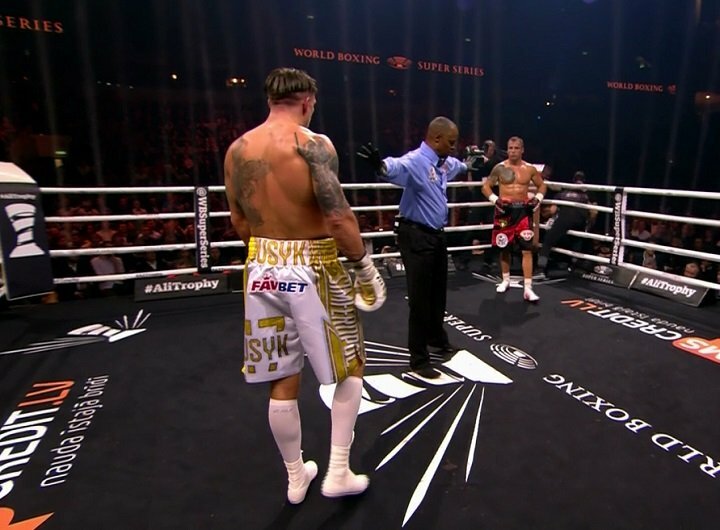 Briedis fought Usyk to a standstill in the first half of the contest, and then took over the contest when he gassed out. Either Gassiev will knockout Usyk or get stopped. Gassiev, 24, has the youth, chin and the punching power going for him in this fight. If Usyk tries to slug with him, it could be a disaster. One of the two fighters is going to need to compromise in order to make the fight happen. Usyk already fought on the road in his first two fights in the World Boxing Super Series against Mairis Briedis and Marco Huck. Gassiev fought away from home in his quarterfinals fight in the WBSS tournament against Krzysztof Wlodarczyk in Newark, New Jersey, and then fought at home in his semifinals fight against Yunier Dorticos in Adler, Russia.